Melt butter in large skillet and add sliced mushrooms. Sprinkle with salt and pepper and cook for 2 minutes, until lightly browned around the edges. Add red wine and continue to cook for 6-8 minutes, until liquid has evaporated. Remove mushrooms from skillet and set aside. Add remaining Tbs of butter and 3 Tbs of wine to skillet and adjust heat to low. Add spinach and sprinkle with salt and pepper. Cook until spinach wilts, about 2-3 minutes. Remove from skillet and set aside. Wipe out skillet and spray with vegetable spray and adjust heat to medium-high. To assemble quesadillas, lay a tortilla down in the skillet and sprinkle with a little bit of fontina. 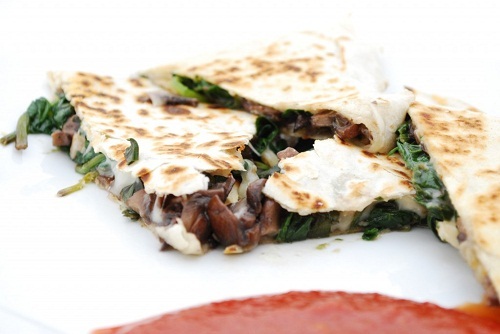 Top with mushrooms and spinach and an extra sprinkle of cheese. Lay another tortilla on top and press down lightly. Let cook until it’s slightly browned on the first side, then carefully flip and brown on the second side. Move quesadilla to a plate and repeat with remaining tortilla. Serve immediately with salsa.